Outrageous wisdom from Southern-fried party-planning queens Kathy Rainer and Tricky Wolfes. Atlanta-based party planners Kathy Rainer and Tricky Wolfes—two Southern women with personalities even bigger than the fêtes they plan—met as sorority sisters at the University of Alabama, then reunited years later planning fund raisers for a local Atlanta hospital. They quickly realized they shared a love for fabulous soirees and beautiful flowers, and decided to start a boutique party planning business, Parties to Die For. Since then, they've masterminded events ranging from intimate home parties to 400-person corporate affairs—all with their signature colorful, lavish style. These days, not only do Kathy and Tricky continue to execute events; the pair—who describe themselves as having a "Lucy and Ethel" dynamic—also often hit the lecture circuit to dish about parties and flowers. This month, they're coming to Sarasota, where they'll present a lecture titled "The Gift of Inspiration" at the John and Mable Ringling Museum of Art's popular Ringling in Bloom. They also shared their party-planning wisdom with us; we just wish you could hear the warm Southern drawls with which they delivered it. The first thing Kathy and Tricky do when they're hired to plan a party is sit down with their client and define a vision. That means asking all the important questions—for example, whether the event is an intimate gathering or a party for 1,000, if there will be a seated dinner, or if the event is outside or inside or requires a tent. "We gauge what the client wants—that's the very first thing we try to figure out," Kathy says. "Then we talk about what they want to spend—we don't want to give them a $5,000 event when they want to spend $100,000!—and develop a theme. And we think big. We like to plan events that are memorable, and we're known for our theme parties." For example, at a recent party for the Atlanta Botanical Gardens, everything in the ballroom was hot pink, from the tablecloths to the decorations; at an Academy Awards party, the pair went so far as to spray paint "buff, muscled-up" men gold and have them stand on platforms, just like the Oscar statue itself. Then send out a gorgeous invitation. "A beautiful invitation should be the start of any party," Tricky says firmly. "In this day and age, we're all incredibly busy and have to pick and choose which events we want to attend—so the invitation sets the tone. Sometimes we go to the extreme of a hand-delivered invitation, or we've done invitations that went in a box or a tube. There has to be something that catches the eye, though, because otherwise it might go in the garbage can." 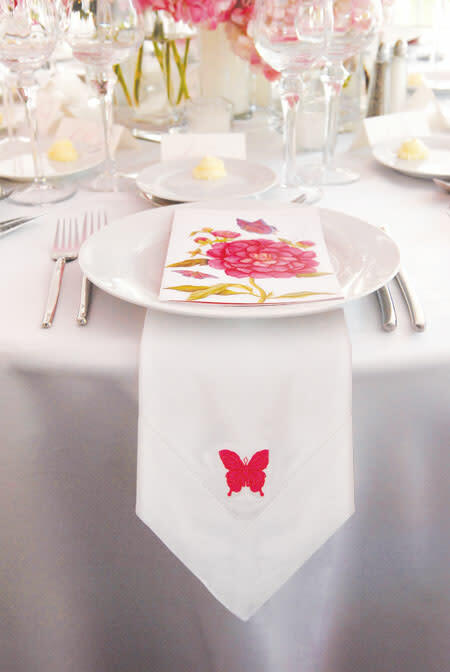 "A beautiful invitation is a wonderful tone-setter for an evening," Kathy adds. "We love scripts, calligraphy, letterpress—you name it, we've done it." Think flowers, flowers, flowers (and don't be afraid to pick from your own back yard). The Parties to Die For ladies are famous for their lavish flower arrangements. "There's something about bringing flowers into your home that people innately respond to—it's luxurious," Kathy says. "We recommend always allocating a part of your budget to flowers, even if you can't spend a fortune." "No matter who our clients are, they're always going to have beautiful flowers," Tricky says. "We never compromise on that. And we think that if it's worth doing, it's worth overdoing." So what's trendy now when it comes to florals? Kathy and Tricky, who both have years of experience arranging flowers, say décor is, ultimately, dependent on the theme and type of gathering. "You're seeing simple vases of flowers on tables, but you're also seeing big, full arrangements—it just depends on the type of event you're throwing," Kathy says. "We always ask our clients what they envision, especially in terms of color palette, and then go from there." Tricky and Kathy also remind their clients to look at their own back yards, where there's often a treasure trove of greenery full of beautiful textures and colors—an excellent, inexpensive option for those who don't want to spend tons of money but who still want to bring a little bit of the outdoors in. Other "eye candy" is important, too. "We have a warehouse full of creative props that we've made!" exclaims Tricky. "You always want to incorporate props to carry your theme. Visual interest—we call it eye candy—is so important." For example, for a party in a private home last year, she and Kathy began with an autumn-themed formal invitation, then carried that theme and autumn colors through the rest of the planning process. "We had to select the right rental chairs, the right china, the right chargers, the right tablecloth, the right containers, the right napkins," she says. And they stick to that method for every single party they throw: "If it's a seated wedding, we might monogram the couple's initials on a hand-stitched linen napkin or have placecards embellished with calligraphy. We're all about details," she says. Take inspiration from what's current—but don't let it eclipse your style. Kathy and Tricky like to let theme dictate décor, but they do turn to books and magazines for help in interpreting their themes. "Once we decide on a theme, I start studying books, magazines, even billboards," Kathy says. "And we do look to color trends, especially in fashion, because they're already in people's minds, so they tend to respond to that." Recent events by the duo have featured turquoise, hot pink, even bright-orange color palettes. "We try to embrace trends without changing our look," Tricky says, "because if you change your look, then what are you known for? You don't want to people to be unsure of what they're going to get. We hope people hire us because they already like our style." Have a great team in place to help. Though Parties to Die For is comprised of just the two of them, Tricky and Kathy have a team of six to eight other people they can call on—many of whom also own their own businesses—to help execute their events. "It is critical to have enough people on board to help you install the event in the proper amount of time," Tricky explains. "And we book them way in advance, because it's crucial to plan ahead. We're doing several weddings out of town this spring, so we'll bring eight additional people with us to help us set up and do all the finishing touches." Food is not the most important element. "I think caterers would fight us on this," says Kathy, "but normally the food does not set the tone of the evening." Instead, she and Tricky recommend focusing on what guests will see when they walk into the party—and to them, that means having decorations and flowers so fabulous they take people's breath away when they step through the door. "The whole mood of the evening is elevated by the décor one sees," Kathy explains. Although they agree that it's important to choose and serve good food, they've learned that's not enough to make a party special. "People start out thinking that the food is the most important thing, but you're probably not going to remember the best piece of salmon you ever had at a party," adds Tricky. "You're not going for a hearty meal; you're going for a memorable experience." But the food should still be beautiful. Even if food isn't the focal point, "We want it to be presented beautifully," declares Kathy. "And these days you're seeing more minimal presentations—not a plate jam-packed with 50 things." She and Tricky recommend adding edible flowers to plates for a pretty, artful touch, or incorporating a dessert that subtly follows the theme of the evening. And speaking of food, keep the beverages flowing—and accessible. Guests can get annoyed by having to wait for a drink at a party because there aren't enough bars, so Kathy and Tricky recommend having servers greet guests at the door with cocktails—and making sure there are enough bar stations set up that guests aren't standing five deep waiting for their beverage. "Most of the time—and it depends on the event, but especially if it's a cocktail reception—people want a drink in their hand that they haven't waited 30 minutes for," says Tricky. "And it's so nice to be offered a glass of wine or champagne at the door." Make the night a gift for guests. Kathy recommends always having a little something special up your sleeve for guests, especially when entertaining at home. For example, to keep things interesting, have placecards at each table setting for dinner—but then ask guests to turn them over and move to a different seat for dessert so they don't sit next to the same person the whole night. "You take your napkin and wine glass and you just move!" she says. "I also love the idea of having entertainment—we recently did a 40th birthday party at someone's home, and an a cappella group came in for a 20-minute spot. It was a brief interlude, but such a highlight of the night." And most important: Invite interesting people. "Especially when it comes to private parties, you want to make sure you have interesting people in those seats, people who you think would have interesting conversation together and challenge each other intellectually," Kathy says. "We're not talking Einstein here—it's just fun when you can have conversation with others and feel like you're learning from them. The most important thing is the people." Rainer and Wolfes are known for their floral arrangements, among them this colorful wedding bouquet; tables at the Flights of Fancy ball at the Atlanta Botanical Gardens featured a program designed by a local artist. "We did an Alice in Wonderland theme for an organization called The Mad Hatters. The entrance looked like tree bark, and when you entered you felt like you were going down the rabbit hole. There was a giant bottle that said 'Drink Me' and a basket of meringue mushrooms that said 'Eat Me,' and the deal was that you ate a mushroom and got small—when you walked into the ballroom, you saw the Mad Hatter's tea party and everything was gigantic. There was a huge table with huge chairs, a massive bar, big plates, big cups. It was fun, whimsical and beautiful at the same time." "We had live camels and llamas parade through the center of a ballroom. It was pretty crazy." "We used a full-size sleigh for a Christmas wedding, with red roses, amaryllis and beautiful greenery, and placed it on a buffet with beautiful, Christmassy things all around it, like a red velvet bag tied off with tassels. It looked so festive and it was gigantic." "We always say that if it's not chocolate, it's not dessert, but we made an exception for this. At the Flights of Fancy event for the Atlanta Botanical Gardens we served pink cotton candy in the middle of the dancing portion of the evening. It was a big hit." "We did a make-your-own-bouquet station for guests as they left the party. There was a cart filled with flowers and guests were invited to make their own bouquet to take home with them." "As the bride and groom drove away from the club in an antique car, fireworks shot up from the ground along the car's pathway. It looked beautiful." Want more party tips? Read editor Pam Daniel's lived-and-learned party don'ts here.